(LANSING, MICH) – The Commanders Group of Michigan is made up of 12 Congressionally Chartered Veteran Service Organizations in the state. Each year they seek nominations for veterans who are active in the community and advocating for veterans. “Veterans are a committed group of people when it comes to helping their fellow veterans in need. However, they are not going to be the ones who pat themselves on the back for the job they do. This is an opportunity for someone or an organization to nominate that veteran who does so much but asks for nothing in return.” says the Michigan American Legion State Commander Steve Striggow. If you know of a veteran who has done outstanding work for your organization or for your local community, nominate them for the Michigan Veteran of the Year Award. Submissions are due by May 15, 2019, see the nomination form here for details. LANSING (JAN 15)- The Michigan Veterans Facility Authority had their first meeting for 2019 today, under the new legislative authority given from Senate Bill 1080 during lame duck. The legislation changed the role of The Adjutant General (TAG) designee on the board. The TAG’s designee is no longer the chairperson, but still a voting member of the board, until one year after the second home is built. At that point the TAG becomes a member with voice, but no vote. The legislation also allowed for the creation of a 501 (c) 3 to raise private funds to help improve the homes. Vice-chair Mary Nader presided over the meeting today, which was attended by all of but one board member, who was present via phone. Note when on the phone that member does not have vote, only voice. A quorum was present. The Michigan Veterans Facility Authority (MVFA) now has three employees. Ann Zerbe, who is running the day to day operations, Mike Hassan, the MVFA building construction specialist, he is in charge of all things construction and engineering, and Joe Bolanowski, financial analyst. Fred Schaible, is the new Michigan Veterans Affairs Agency Legislative Liaison, who will split duties between the MVAA and the MVFA. Fred worked in Senator Hildabrand last legislative session. The board approved up to $50,000 to be spent on creating a brand image, so material and digital media assets can be created so they may communicate to the general public and to possible donors their mission and purpose. This begins the process. Asbestos abatement will begin in Grand Rapids in the next couple of weeks in the building being torn down. Note if you are a volunteer, please be patient while construction begins. Some tree removal will also be taking place this winter at the GRVH and at the Sebille Manor location. Requests for bids for building contracts were sent yesterday. The goal is to put shovels in the ground this spring in both locations, completion for March 2021. The Jacobetti Veterans Home in Marquette became CMS qualified on October 1, 2018 for 26 beds. Steve Rolston, Chief Operating Officer, for the Michigan Veteran Health System stated they are seeking to qualify 55 more beds soon. What CMS does for the homes is allows them to be reimbursed from the Medicare and Medicaid systems for certain veteran patients who qualify. An additional revenue stream. Grand Rapids Veteran Home is not CMS qualified and will not be in its current facilities; the physical structure does not qualify for certification. Once the new homes is built then CMS will be available. David Henry was nominated and unanimously voted to be the new board chairman. He assumed the position at the close of this meeting. Director of the Michigan Veterans Affairs Agency has not been hired as of today. It is our understanding that the new the TAG, General Rogers is evaluating the whole department of military and veterans affairs before making a decision on a new director. Great conversation was had on the how to handle the upcoming transition, the foundation, and a CEO for the authority. Note, the issue of smoking was brought up again. Steve Rolston is collecting data that the board requested and will present his findings at the February meeting so the board can hear several sides of the issue and the implications of such a policy for the future. 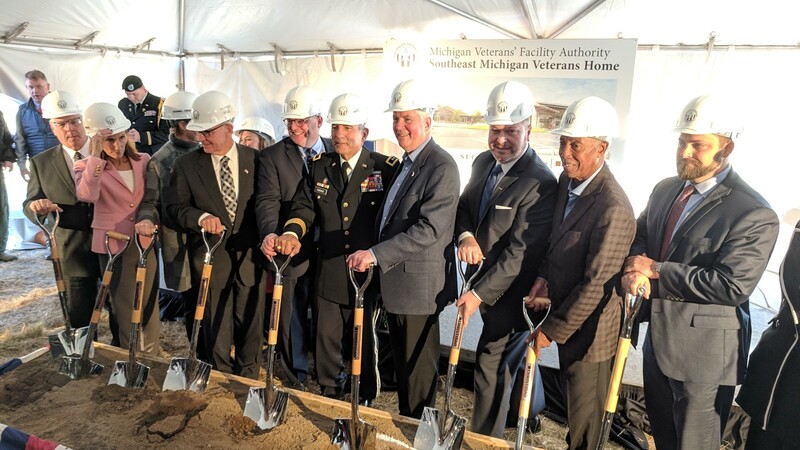 Great things are happening and it is exciting times for the veterans in Michigan. If you have any questions feel free to contact me via email at mark@michiganlegion.org. LANSING (JAN. 14) – The 100th legislative session in Michigan opened last week. The new class of Senators and Representatives were sworn in and began working. Before leaving on Thursday afternoon, the Senate named their committees for the new session but introduced no new legislation. The House has not announced their committee structure yet but introduced some legislation. Changes from the previous session, the Senate has decided to eliminate the Military, Veterans Affairs, and Homeland Security committee and place it into the Families, Seniors, and Veterans committee. It was this way several sessions ago and is now returning. Assignments to sub-committees for Appropriations have not posted. Appropriations–Sen. Stamas (Chair), Sen. Bumstead (Vice Chair), Sen. Barrett, Sen. Bizon, Sen. LaSata, Sen. MacDonald, Sen. MacGregor, Sen. Nesbitt, Sen. Outman, Sen. Runestad, Sen. Schmidt, Sen. Victory, Sen. Hertel (Minority Vice Chair), Sen. Bayer, Sen. Hollier, Sen. Irwin, Sen. McCann, Sen. Santana. New House legislation introduced: If you are a military retiree or received a pension House Bill 4006 seeks to undo the taxing of pensions. House Bill 4023, will create a pilot program to allow military medical personnel to practice under the supervision of medical professions. House Bill 4026, expands concealed weapon laws. Look for updates as the session continues. For more information check out www.legislature.mi.gov. Frankenmuth American Legion Post 150 Honors One of their own. The Frankenmuth American Legion Post 150 honored Mr. Chester Geno, a WWII veteran with recognition for his military. Pictured are Post Chaplain James Miller, United States Army National Guard, Ralph Haubenstricker, Richard Kirchner, Post Commander John Warnick, and Paul DeSander. Front row, Chester Geno. The presentation took place at Independence Village, with about ten family and friends. Chester military service began when he was drafted into the Army and after basic training, was assigned as a member of a machine gun squad with the 14th Armored Division, 62nd Armored Infantry Battalion. During the Battle of Hattan which occurred as part of Operation Norwind (the last German offensive of the war), he was assigned as a replacement driver in an M4 tank after the original driver was gravely wounded. Chester himself was already wounded, but instead of sending him to the rear line, he was assigned as a replacement driver. He survived the war and went on to work for General Motors for 37 years, was married to Marie for 71 years and had one daughter, one son and now enjoys his four grandchildren and ten great-grandchildren. The 2019 Annual Commander’s Winter U.P. Tour begins at the Newberry American Legion Post ( 7964 STATE HWY M 123) on Sunday, January 20. Department Commander Striggow will be accompanied by Department President Williamson and Detachment Commander LaMunyon for the week-long event. Take the opportunity to meet the department commander. What are tours meant to accomplish? Tours, whether they are for the Upper Peninsula, the 16th District, or another district in the State of Michigan is all about meeting the membership. Michigan is a large state, and the commander’s term in office is only one year. They want to meet as many members as they are able. Tours, set up by district commanders and zone commanders help the department commander meet that goal. The tradition has been going on since the beginning of the American Legion. Who is invited to one of the stops on tour? Everyone is invited to meet the commander at any one of the several stops on tour. They want to meet you, and they want to hear about what Legionnaires are doing for our veterans and our military. Stop in, and share your story. The tour begins on January 20 at the Newberry American Legion Post at 6 p.m. for dinner. On Monday the tour stops at the Engadine Post at 1 p.m. for lunch and then moves on to the Gladstone Post for dinner at 6 p.m.
On Tuesday, lunch will be served at the Rock Post at Noon; then they will head to Marquette for a tour of the Jacobetti Home for Veterans at 3 p.m. and dinner at the Marquette Post at 6 p.m.
Wednesday the group will have coffee and rolls at the Greenwood Post, before heading to Hancock Post for lunch at Noon. Then the caravan heads to the Lake Linden Post for dinner at 6 p.m., Yes, those on tour eat all the time. Food and fellowship are the cornerstones of camaraderie. On Thursday, the tour will visit the Wakefield Post for a Noon lunch and then head to Iron Mountain for a 6 p.m. dinner visit. Friday the group will receive a tour and briefing at the Iron Mountain VA Hospital at 10 a.m. CST before traveling to Stambaugh Post for the beginning of the U.P. Association Winter Meeting that begins Friday evening and runs through Sunday. For more information and details contact the 5th Zone Commander Carl Morrison at (906) 249-4315. About four years ago I came across the Library of Congress’ “Veterans History Project” and thought it would be a great idea if I would interview my uncle who lived in the Detroit area. Uncle Jack enlisted into the Army upon his graduation from Midland High School, his two older brothers Bob (my father) and Don had enlisted previously. Our family had been a “Midland” family since 1869. Uncle Don passed away back in 1974, shortly after I received my discharge from the Air Force. I never got to know him very well, since upon coming home from WWII he moved to Texas. When I was about ten years old, he moved into the house next to us. Uncle Don was wounded during the war, and upon coming home, he was encouraged to apply for employment at the U.S. Postal Service, which he did. He continued to work at the post office until he retired. My father served as the First Sgt. for the Repair Squadron of the 45th Air Depot Group. There was at least one time that my father managed to meet Uncle Don behind the lines during the war. Dad brought home plenty of pictures and souvenirs which we have all enjoyed. Fortunately, I have ended up with his military records and uniform and have learned much about him. Though Dad brought home the souvenirs and pictures, he never really talked much about his service, although he did enjoy attending reunions of the 45th ADG. My father passed away on December 31, 1992. Then there was Uncle Jack. He took me to my first Tiger baseball game and made us laugh every time we visited him. After the war, Uncle Jack settled down in Livonia, and he would often show us small town boys a part of the “big city” of Detroit. Uncle Jack was a great guy. He cared about his family, all of his family. Uncle Jack passed away Wednesday, November 21, 2018, the day before Thanksgiving. I’ll be attending his funeral tomorrow. Why do I share this bit of personal history with you? Because the personal stories of three veterans who participated in this county’s greatest war are lost forever, and I have to live with the memory of my good intentions. Four years ago, when I learned of the Veterans History Project and a dozen times since, as recent as just a few days ago, I intended to interview Uncle Jack and record his stories and his memories. Now it’s too late. As members of the American Legion, we should resolve that the histories and memories of every veteran be recorded. The stories of their service and sacrifice should be preserved for all time so that younger generations will understand the cost, or value, of what they have inherited. To accomplish this task promptly will require the efforts of every Legionnaire in every Post. Participants in the Project may be a veteran, an interviewer, or person donating a veteran’s collection. Students in the 10th grade and above may participate as well. The Project also provides an ideal opportunity for a Boy Scout Eagle Scout Service Project or a Girl Scout Gold Award Project. I encourage you to go to www.loc.gov/vets/ and review the information found there, print it off and schedule an interview with a veteran. Start with someone you know and expand your circle. If you are associated with Scouting, then you have a great opportunity to network and encourage Eagle Projects. If we are to capture the stories of our older veterans, we must begin now and work quickly. I would suggest that you share this information with all of the Scouting units in your area, whether or not they are Legion chartered units. It’s all hands on board! Let’s work together to preserve the history, sacrifice, and service of our Michigan veterans. Currently, there are approximately 15,868 World War 2 veterans living in Michigan. Statistically, five leave us every day. Scout Thomas Payeur of Saline needed a project to earn the title of Eagle Scout. He visited the Earl Gladfelter Post 268 in Milan and asked if he could make a U.S. Flag retirement box for the post and to make videos pertaining to the flag. Making the box was step one. He then proceed to make three videos. The first one pertains to buying a U.S. Flag from American Legion Emblem Sales. See videos below. The second video demonstrates the retiring of a single flag that is not serviceable. The third is about retiring multiple flags. American Legion posts can be a great place for these Boy Scouts to show off their talents. These are the videos he produced. 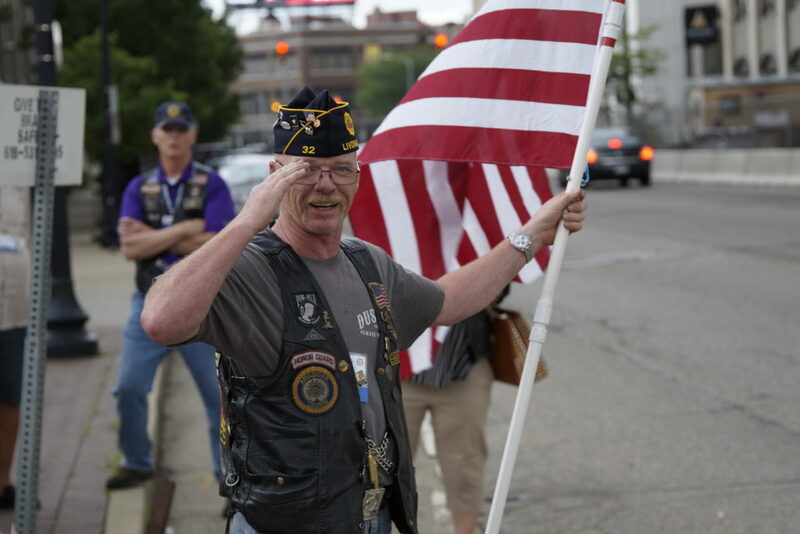 Buy an American Flag from The American Legion and support their mission. How to retire a U.S. Flag properly. What is a serviceable flag? The 2018 Lame-Duck Hang Over – How did the bills do? Updated December 29, 2018 to reflect the Governors response to the listed bills. It is Friday December 21, 2018 and The American Legion Department of Michigan was keeping an eye on a few bills during this lame-duck session let’s see how things turned out. Note: This is the end of the 2017-2018 legislative session any bill that was introduced and did not pass both chambers by the end of last nights session, which ended at 0735 this morning is dead. However, a new legislative session begins January 1, 2019 for two years. Bills could be resurrected by a different legislator in the new session. We are forever mindful. HB 4985 and HB 4986 DEAD – These bills would eliminate the 100% disabled veteran property tax exemption and turn it into a Homestead Tax credit instead. The bills did pass through the House committee but did not receive a vote on the floor of the House. It is high likely that this issue will be resurrected in the next session. HB 5913 – PASSED – SIGNED by Governor A bill to include veterans service organizations that are 501 c 19’s to be exempt from sales tax on items they purchase for running their organizations. SB 35 – PASSED – Vetoed by Governor Charitable gaming reform in favor of the non-profit organizations. HB 4474 – PASSED – Signed by Governor – To allow national guard, active duty military, and reservists who are properly licensed to conceal carry a firearm on to state military bases. They could do this before, but it was at the discretion of the Adjutant General. Now it is law. HB 6024 – Died This bill would have allowed veterans who qualify for the property tax exemption to submit their VA designation letter one time instead of annually. It passed the House and the Senate committee but did not receive a floor vote. HB 4785 and HB 4786 – Died The bills would have offered pet owners to give ten dollars to a fund to support grants to veterans in need of a service dog. SB 1040 – PASSED – Vetoed by Governor expand historical vehicles to include Military vehicles. These bills were on our watch list for lame duck. Bills that did not pass this legislative session are sure to be resurrected in the next legislative session. We will continue to be vigilant.